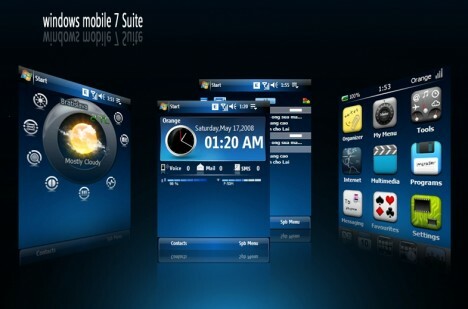 Windows Mobile 7 will bring new features such as full touch-based navigation and motion gestures control. WinMo7 will not rely on accelerometers, but using the front facing cameras to detect movement. You can shake or twist to get the phone doing things. New WinMo 7 is designed to be used on devices with touchscreen only, several keys, full QWERTY keyboards, and devices without touch screens. It is designed for better media playback with much-improved Media Player and photo gallery application. Mobile Internet Explorer runs full-screen web pages in a minimalist interface with “tabbed” browsing. You can switch tabs by shaking the phone. WinMo7 dynamically resize elements of the user interface, prioritizing them and making them easier to hit. Corners, like the close button, scrollbars, icons and the title bar/status bar, will be able to grow to make things easier on the user. Gestures for scrolling (horizontal and vertical), task and menu access, press and hold controls, list items, press and drag, and launching shortcuts will be available. Windows Mobile 7 device will also be able to detect finger velocity, scrolling further if the user’s finger moves faster. For on-screen keyboard, the letter enlarges and appears above your finger when you hit it, just like on the iPhone. When highlighting text, a zoom/edit box appears above it to show what you are highlighting. When in full page view in IE Mobile, if you hit an area with links it will zoom in with a bubble and help you choose from the links. There is a part talking about allowing the user to draw “doodle” on the device lock screen, as well as shake the screen to affect the wallpaper (like making water run, or blurring an image). It will be a lot more gestures that are being explored and may or may not make it into Mobile 7. Microsoft clearly has plan to make Windows Mobile 7 the revolution to compete with Apple. It is something worth to look forward to, that WinMo7 will bring some cool and excitement to Microsoft’s smart phones. It will still be at least a year before that become reality.